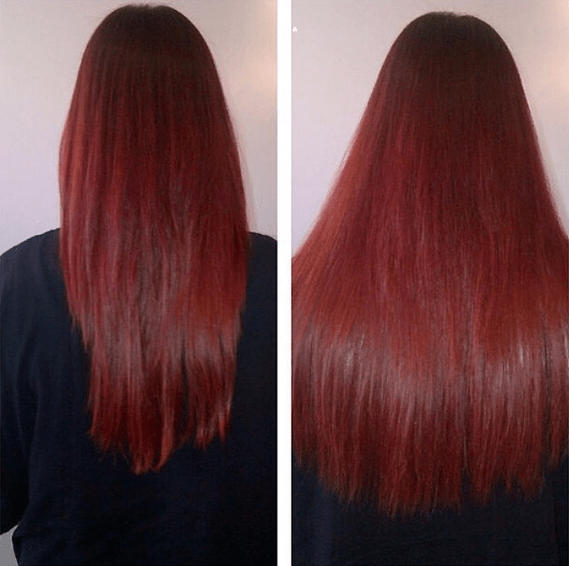 See the incredible difference our products can make in your life and with your hair! 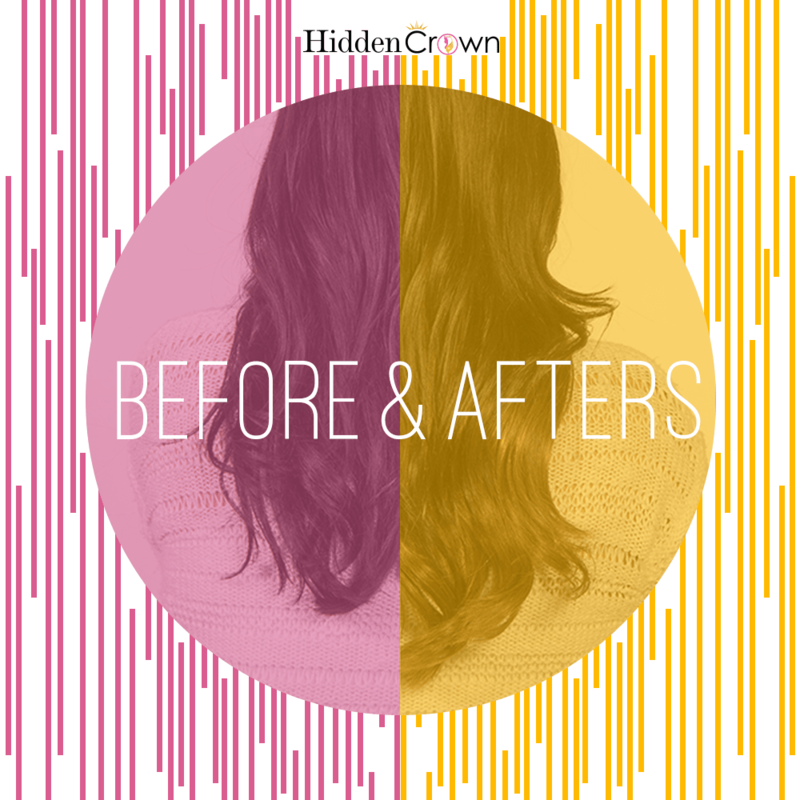 Our first product, our Hidden Crown Hair Extensions, is double drawn, which means it is thick all the way through. 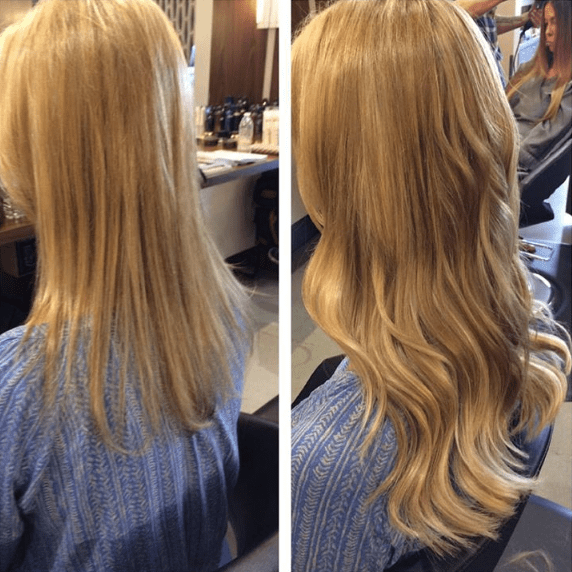 From the weft to the ends of the hair it features the same thickness so you don’t lose out on any of your added volume! Our other brand of extensions is our Daydream. 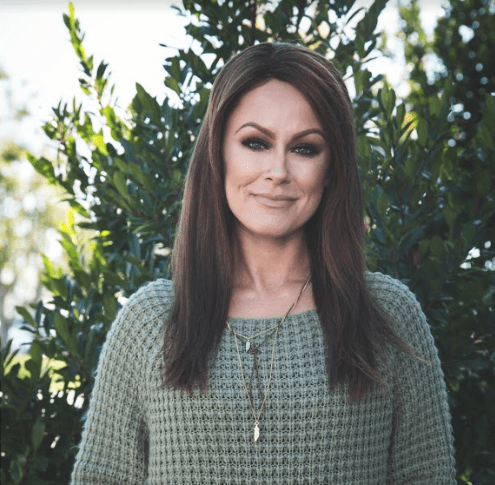 The DayDream also features tapered ends, which means the extensions are thickest at the very top by the weft and get thinner as you get to the ends of the extensions. This is for those who like the extra hair but also don’t want their ends to look too thick. Hidden Crown – Color #60 dyed with Provana red with a touch of purple. Last but not the least at all is our Crown Topper! 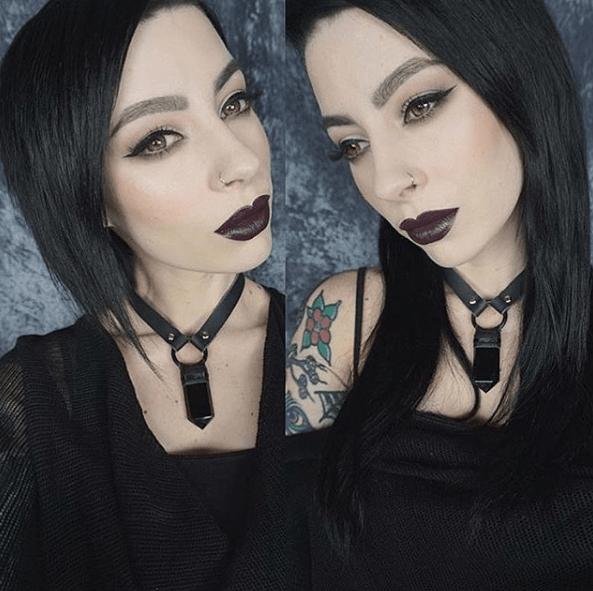 Our newest extension line & the one that allows anyone to be able to change up their hair color at a moments notice without the fuss or damage of using hair dye! 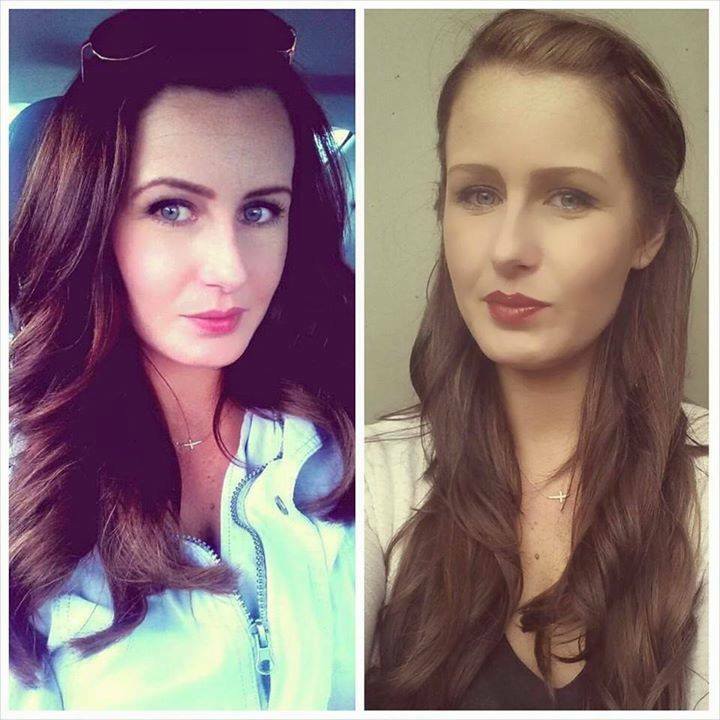 The first photo below shows Bonnie B. wearing our Crown Topper alone, with her natural blonde hair tucked up and out of sight to create a short brunette look. 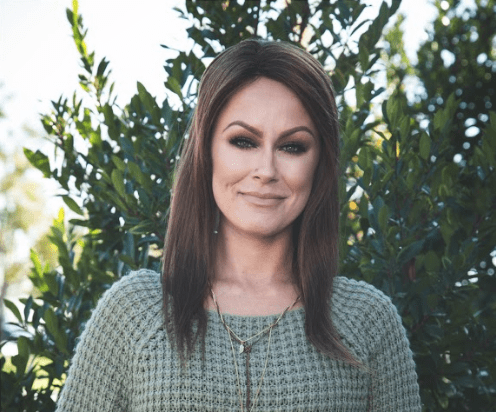 The photo below that one shows Bonnie B. wearing our Crown topper over our Hidden Crown hair extensions to create a fuller look with the same color. Depending on how much hair you want and what color, will help you decide what you should order! Don’t forget to send us your before & after photos as well! We absolutely love seeing what kind of change our extensions can make and what kind of hairstyles you will create with them! Chloe Putting On a Crown without a Mirror! 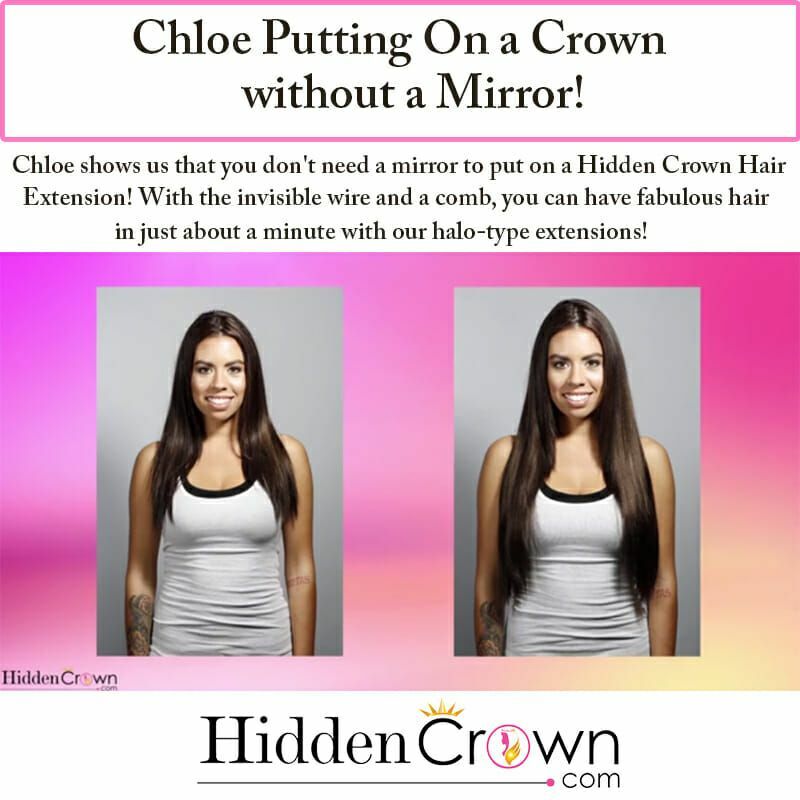 Chloe shows us that you don’t need a mirror to put on Hidden Crown Hair Extension! It’s so simple! With the invisible wire and a comb, you can have fabulous hair in just about a minute with our halo-type extensions! Putting on your halo-shaped extension is easy as 1, 2, 3! How does the Hidden Crown stay put? The invisible wire that the hair extension is attached to simply sits on your head and is undetectable. It takes less than one minute to put on and literally one second to remove. It is perfect to use for anyone with thin or damaged hair because it does not attach with glue, clips or tape causing more problems with your natural hair. Chloe is wearing Hidden Crown color #2 in 20 inches. Watch the full video of Chloe putting on her Hidden Crown without a mirror Below!! Can I Wear a Hidden Crown With Short Hair? 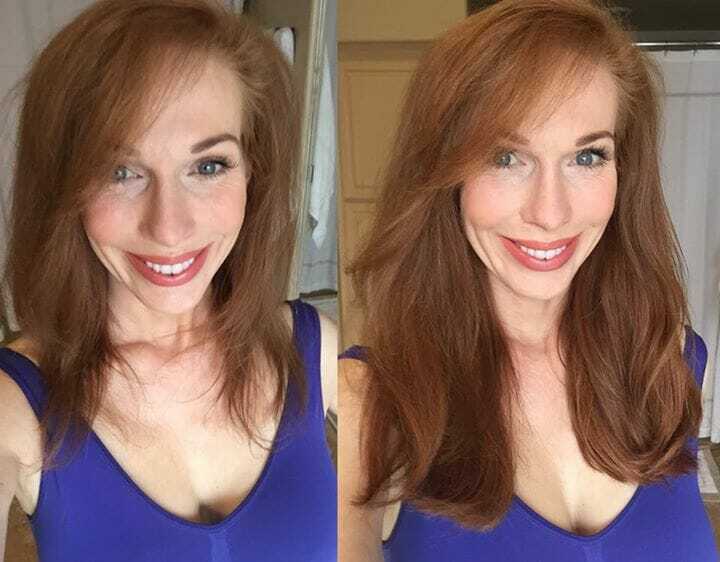 The photo above is Bonnie’s gorgeous new haircut! She decided to cut her hair into an A-line style with layers, to blend her Hidden Crown even better with her hair! Photos of the back view will be posted soon. 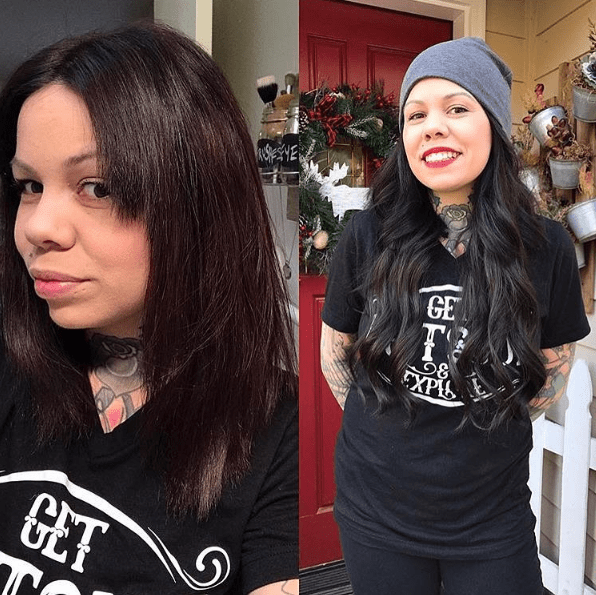 Take a look at the photos below to see Bonnie’s hair recent hair transformations from present to past… and see how she blends her Hidden Crown with these variations of short hairstyles. In this photo, Bonnie is wearing color #60 with a length of 12 inches. The color matches perfectly, and the length looks flawless. 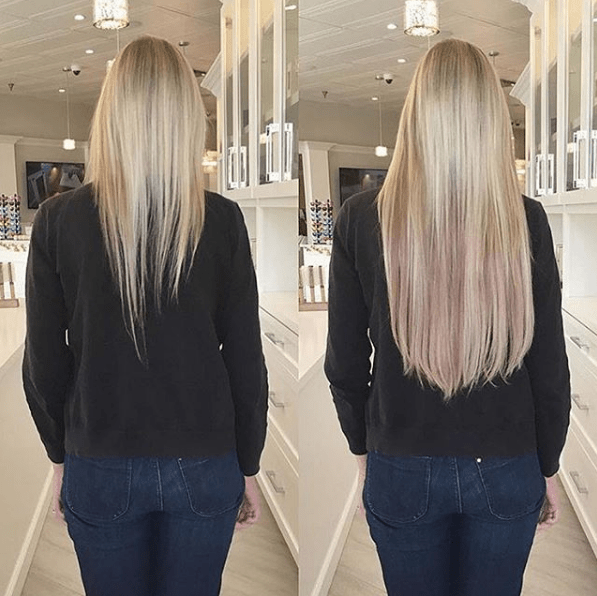 For an individual who is new to using extensions, 12 inches is a great length to begin with… and after you are accustomed to the extra hair, it would be great to graduate to longer lengths! (And even use your 12 inch Hidden Crown extensions for stacking). WHAT IS STACKING? !… you may ask. The Hidden Crown has 140 grams of the finest quality REMY hair to add instant length and volume. (12 inch Hidden Crown has 120 grams). This is the same amount of hair purchased for a full set of clip or bonded extensions. But we use a method called “Stacking” to add even more volume and also allow for a natural look with layers. In this photo Bonnie is wearing color #60 with a length of 12 and 16 inches. This photo will show you can also have very short hair and wear the longest extensions, and still hold a natural look! This photo displays Bonnie in color #60 with a length of 20 inches. Here is a photo of Bonnie with a longer length of short hair. Hidden Crown is functional not only to allow length, but thickness! This is Hidden Crown #60 with a length of 12 inches. 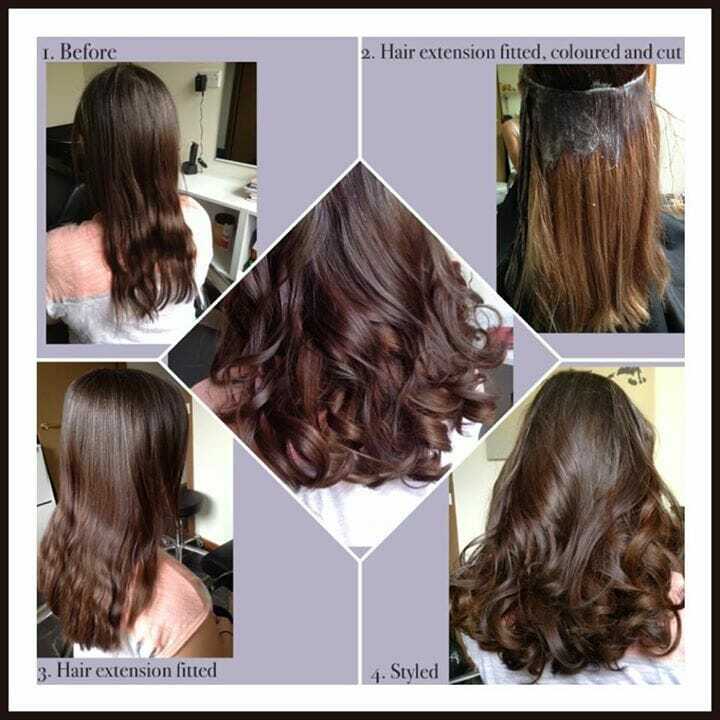 We do also get many questions about blending Hidden Crown Extensions. Please keep in mind extensions do not act as a “one size fits all” type of hairpiece. Everybody has different style, color, texture, etc. types of hair! 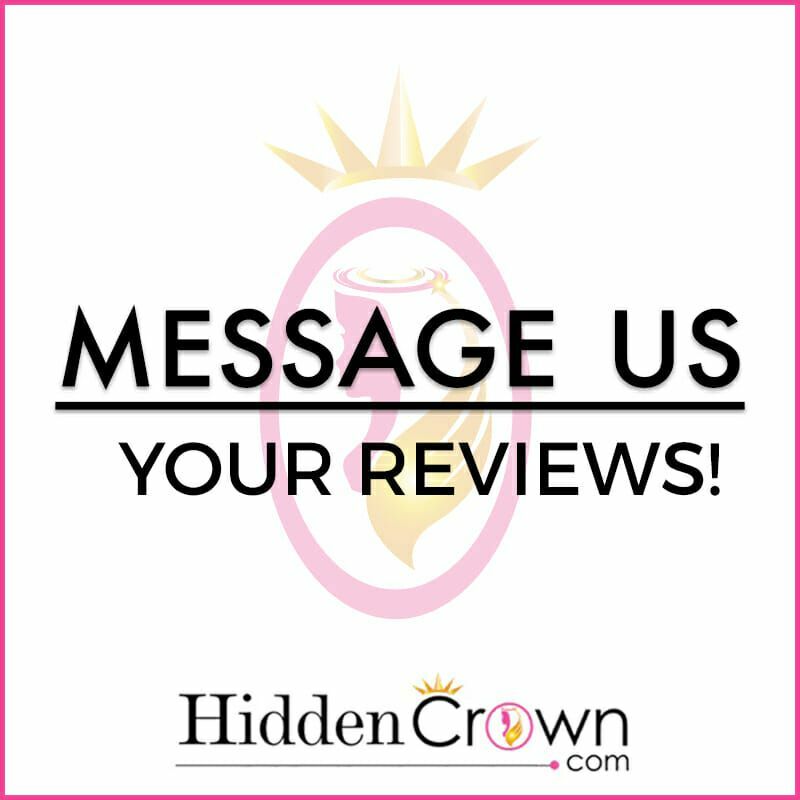 When you buy your Hidden Crown Extensions, do not always expect to pull them out of the package ready to put on and walk out the door for a night out on the town. Your Hidden Crown should often times be customized, especially with layering. This will help your straight hairstyles blend even better! 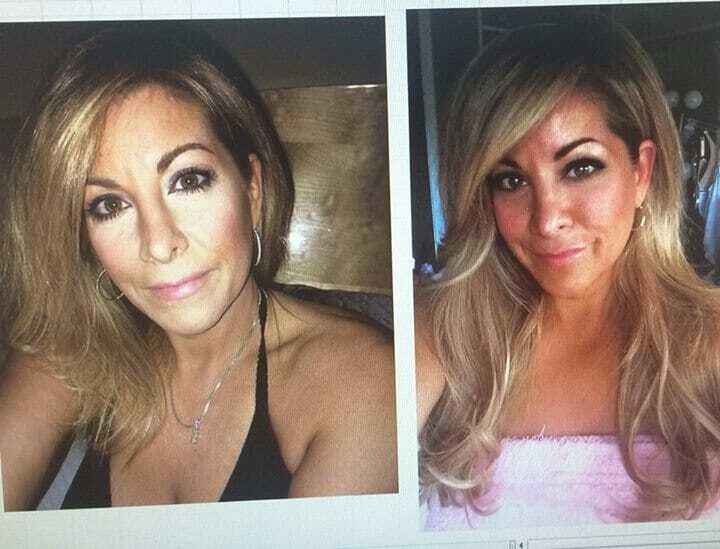 In this photo Bonnie is wearing a custom layered Hidden Crown color # 60 with a length of 16 inches. Lastly, here is a photo of Bonnie wearing color #60 with a length of 20 inches to show how some curl or wave will also help blend your Hidden Crown and add some fun style!! Follow our social media for giveaways, updates, & much more!